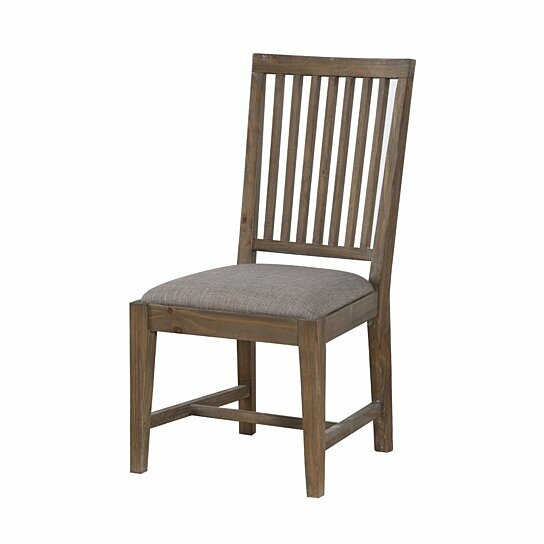 Give your dining room a stylish combination of rustic design and casual atmosphere with this chair. Made from wood in an oak brown finish, this chair will add a rustic element to your home design. The chair features a slat style back design, fabric upholstered padded seat and tapered legs that are reinforced with stretchers to add style and strength. Pull this chair to your table and let your dining room exude a clean and rustic appeal. The chair features curved slat style back & cushioned seat. The frame of the chair is made from durable wood while its seat is upholstered in linen like fabric. The chair is bolstered by stretchers that not only provides stability but also provides a place to rest your feet.